A CMS (Content Management System) is a way of changing website content online. 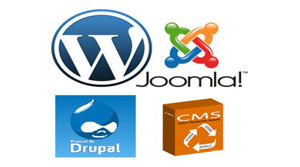 CMS used to enter, import, export, schedule and publish websites and other files and information. Usually changing, editing, updating, maintaining or archiving content such as text, pictures and in the good ones menus, navigation and page layouts using built-in templates. Some are very expensive and can manage large amounts of data while others are rather cheap and inexpensive. A CMS can be reasonably simple or very complex. There is a wide range of CMS products available, developed by providers such as Microsoft, the open source community and small development companies. There are many open source or free content management systems available like as WordPress, Joomla, Drupal, Expression Engine, Elgg etc. WordPress and Joomla are most popular CMS. Some CMS are custom-made for more specific websites where Solver Circle Ltd provides this custom-made CMS. Choosing the right CMS can be an important decision for your organization. It is a platform that aids in the management of content on a Web site.